Fast speed and precision movement is Azimuth's key success to enable our customer in system automation and customization. 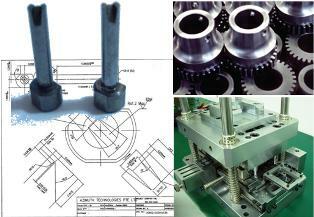 We act accordingly to customer production line requirement. In Semiconductor backend packaging, Azimuth's team engineer with mold/chase and Trim/form tooling.Whether to make new tools from zero, or reverse engineer tooling to suit customer existing machine/equipment, we ensure the accuracy and functionality. In the various industries, Azimuth provide one stop solution from Design, fabrication to on-site installation and commissioning.